The new method, developed by researchers at Carnegie Mellon University, Pennsylvania State University and MIT, offers the potential to accurately print 3D multicellular architectures for applications in biomanufacturing, tissue engineering, regenerative medicine, neuroscience, and cancer metastasis research. Multicellular structures within living things are complex and delicate, which makes recreating or repairing these structures a daunting task. For example, the human heart contains more than 2 billion muscle cells. Each of these cells must properly interact with one another and with their environment to ensure that the heart functions properly. If those cells aren’t placed correctly, or are damaged, it could potentially result in any of a variety of heart conditions. Researchers have been using a combination of approaches for recreating the complex, multicellular architecture of biological tissue and to separate, align, pattern and transport single cells, and the approaches are renowned for their ability to gently manipulate cells without causing any cellular damage. But they have yet to develop a single method that has the high level of precision, versatility, multiple dimensionality, and single cell resolution needed to form complex multicellular structures while maintaining cell viability, integrity and function and without the need for invasive contact, tagging, or biochemical labeling in regenerative medicine, neuroscience, tissue engineering, bio-manufacturing, and cancer metastasis. The new microfluidic device developed by the team has now allowed the researchers to manipulate where the waves would meet along each of the three axes. 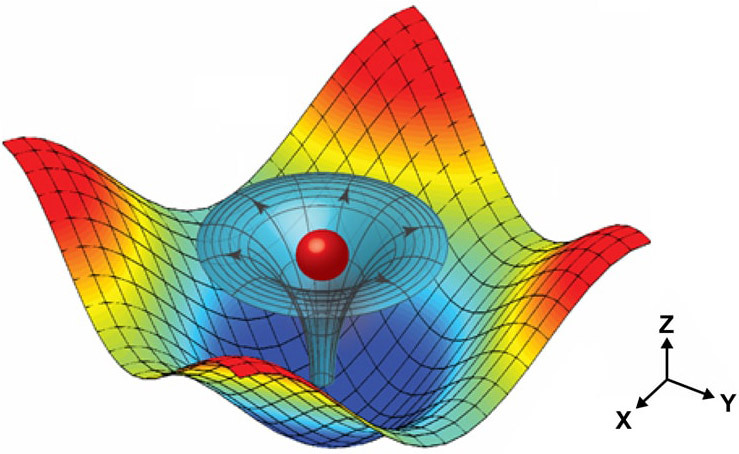 At these meeting points, the waves formed a 3D trapping node that captured individual cells. The researchers could then further manipulate the acoustic waves to move and place cells. 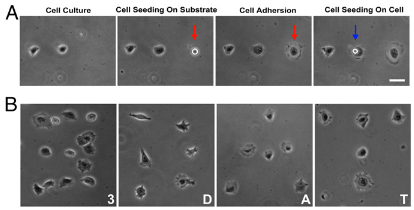 To demonstrate how their acoustic tweezers technique could be used for live cell printing, the researchers used the microfluidic device to pick up cells and deposit them in a pre-selected pattern, with an elegant level of control over cell spacing and geometry. That suggested that the device has the potential to effectively create 3D tissue-like structures, including those with complex geometries. * Typically, cells are printed in a substrate or matrix to form tissue for later implantation (see “Robust ‘spider silk’ matrix guides cardiac tissue regeneration“). The ability of surface acoustic waves to trap and manipulate micrometer-scale particles and biological cells has led to many applications involving “acoustic tweezers” in biology, chemistry, engineering, and medicine. Here, we present 3D acoustic tweezers, which use surface acoustic waves to create 3D trapping nodes for the capture and manipulation of microparticles and cells along three mutually orthogonal axes. In this method, we use standing-wave phase shifts to move particles or cells in-plane, whereas the amplitude of acoustic vibrations is used to control particle motion along an orthogonal plane. 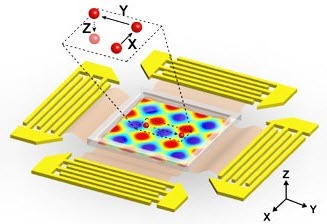 We demonstrate, through controlled experiments guided by simulations, how acoustic vibrations result in micromanipulations in a microfluidic chamber by invoking physical principles that underlie the formation and regulation of complex, volumetric trapping nodes of particles and biological cells. We further show how 3D acoustic tweezers can be used to pick up, translate, and print single cells and cell assemblies to create 2D and 3D structures in a precise, noninvasive, label-free, and contact-free manner.